This is another piece created for one of Jon Schindehette’s Art Order events: the “Viking” challenge produced in collaboration with Allison Hourcade of RockLove Jewelry. 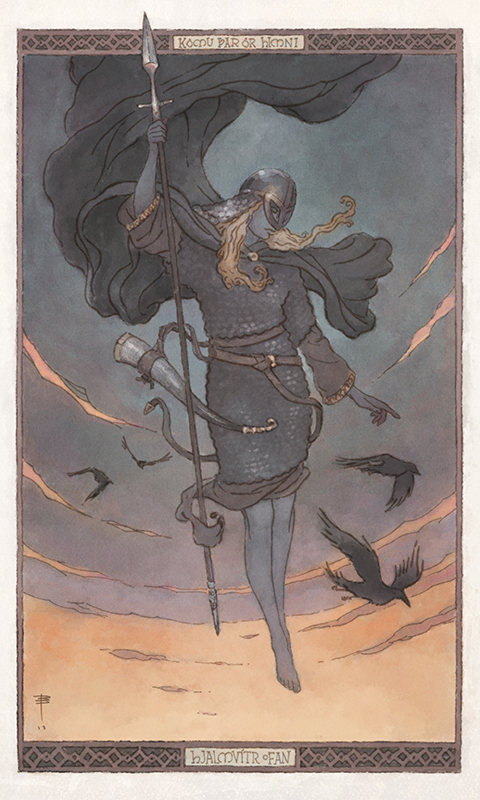 Allison has produced a really wonderful new line of work based on historical viking hoard finds, and the art challenge was simply to include one or several of these pieces into an illustration. I decided this would fit in thematically with some work I am currently doing anyway. I’ve been researching viking history quite a bit in recent years, and I’m especially interested in some of the newer theories about social structure, fashion and gender roles. This character builds off accepted historical material and plays into some of the newer ideas. As with Drakflickan, the model for the young woman was the gracious, beautiful and very patient Elin Hökby, who quite definitely possesses a valkyrie’s spirit. Rune stones are pretty fascinating in and of themselves, and I’ve been lucky enough to get to see some important ones up close. I thought this was a good opportunity to get one into a painting. 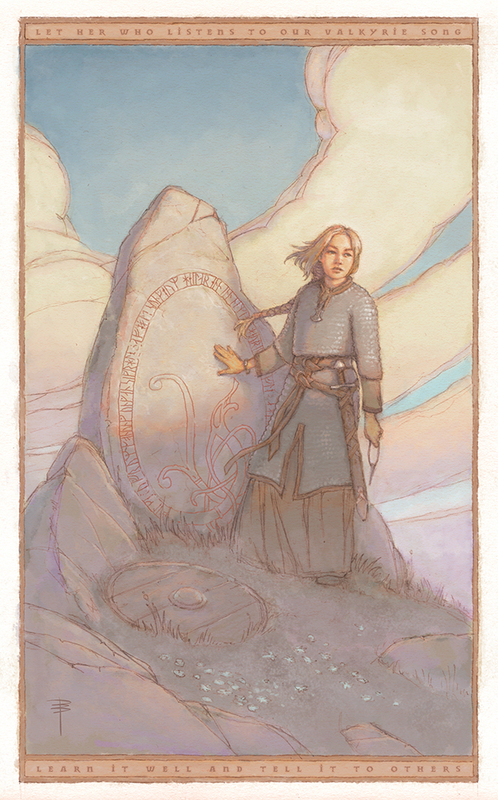 The inscription on the stone is several stanzas which I quite liked from the skaldic poem Darraðarljoð. The Younger Futhark runes spell out the stanzas in Old Norse, and I hope I didn’t muck it up too badly. 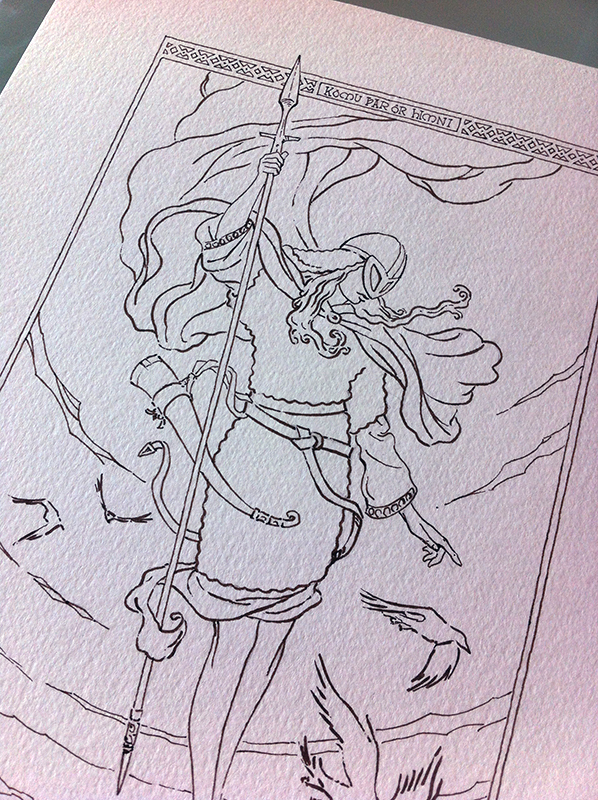 Carl Larsson’s Viking Woman was also an inspiration for this piece. Wanderlust won first prize in the Comic/Graphic Novel category, and was one of the three nominees for “Best of Show”. Sincere thanks to all the judges and organisers for your time and effort in producing the challenge! 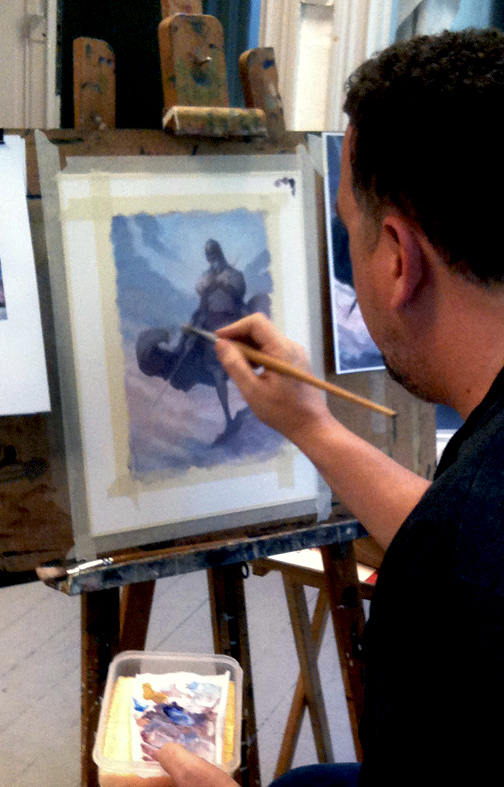 Also as with Drakflickan, the painting is graphite on 120g Canson croquis paper, and was digitally coloured in Photoshop CS6 using Justin Gerard’s excellent watercolour tool presets. This is my entry into the recent Art Order challenge with the theme “Dragon World”. 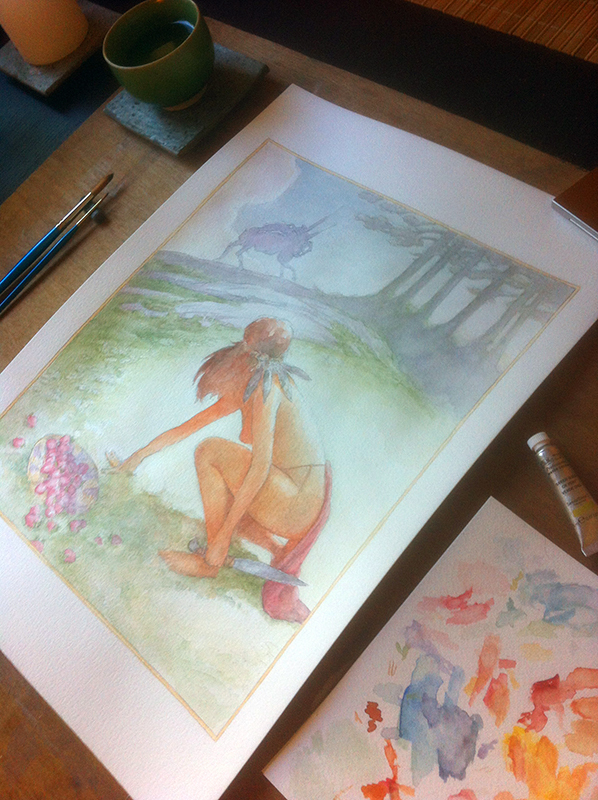 This is intended as the cover to an imaginary book for older children called “Drakflickan” (“The Dragon Girl”). The idea of the challenge was to not only depict a dragon, but to show the dragon’s integration and influence with the world that it inhabits. 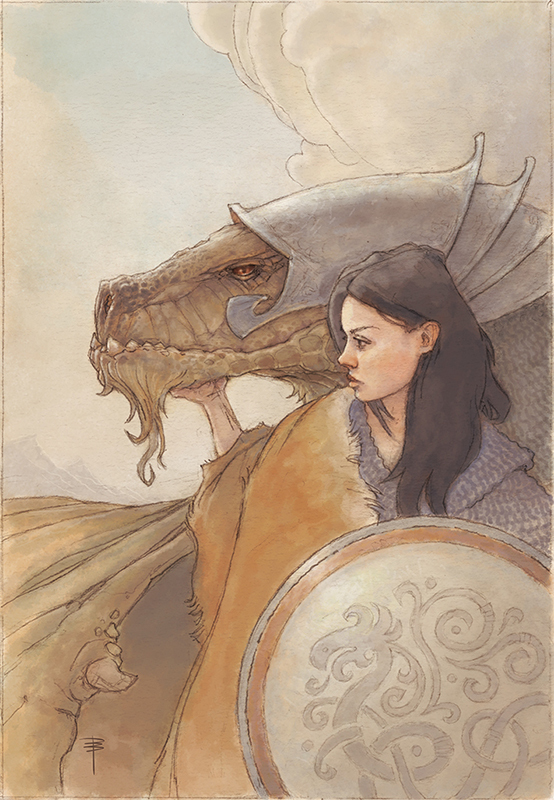 I worked to achieve this by showing an intimate and obviously comfortable connection between the girl and the dragon, and suggesting some sort of working relationship by having them both be similarly armoured. I didn’t want to do be too explicit about what the relationship between the two actually involves, whether they are equals or one serves the other, but the motif on the shield hopefully implies that they’re involved in some larger tradition of their cultures. 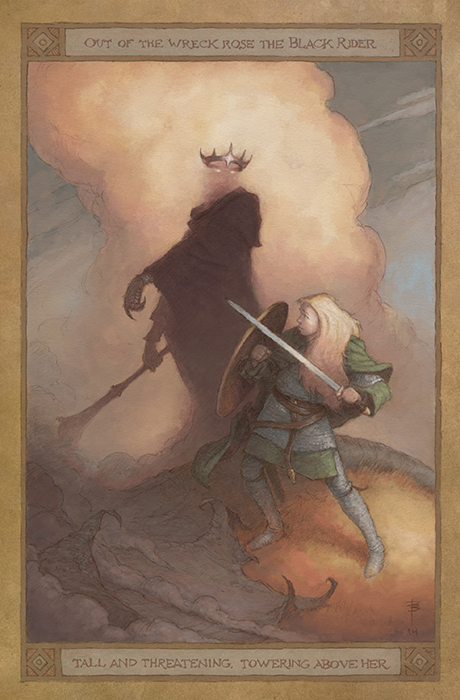 This was created with graphite on 120g Canson croquis paper, and was digitally coloured in Photoshop CS6 using Justin Gerard’s excellent watercolour tool presets.